Electronic Kit School. - There are many electronic circuit that designed to result the best car charger with low loss power. One circuit that can produce low loss car charger battery is shown look like in Figure 1 below. With the main or major component used are LM311 IC and transistor, this circuit can be used for a lead-acid battery with liquid acid, typical size 12V / 50-80Ah. the acid is in a kind of sponge or felt, they can be operated sidewards, the acid will not flow out. They are sensitive to water loss. 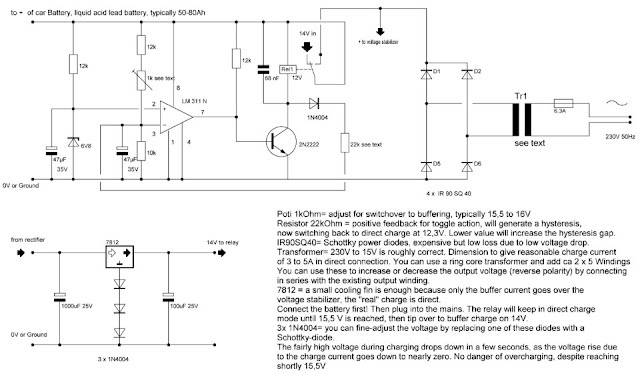 The charge stop voltage must be lowered to some 14.5V and the buffer voltage to some 13.2 to 13.6V. Circuit like in Figure 1 above show you about the Low Loss Car Battery Charger Circuit using LM311 IC that give you one reference circuit to build by yourself of charger circuit in your car with low loss power. From Electroschematics site that the basic charge is performed by a transformer and rectifier without any control through transistors or thyristors. You can accept any current from ca 4 to 6 A. The direct charge is very efficient, as only the inevitable losses of the transformer and rectifier are involved. To further get the losses down, I replaced the silicon bridge rectifier with Schottky diodes, and for the transformer I employed a cut-band core transformer. Also a ring core transformer would be good. Using a 160W transformer with 15V winding gave automatically a charge starting with 6A (battery on 11V) then going down to 3A with rising battery voltage. If you need to make adjustments, it is easy to put some additional windings on the transformer. Typically 3-5 windings give one volt, which you can connect in phase or anti-phase with the existing secondary winding.